This film tells the story of two sets of grandmothers - one in a battered township of Johannesburg, the other in a quiet rural corner of Canada. This film is about how the extraordinary bonds of friendship between these two groups of women is helping to win the fight against AIDS. Lucia lives in Alexandra, the poor township that Nelson Mandela first lived in when he came to Johannesburg. She is talking to Brenda Rooney, a granny from a very different walk of life. 'You didn't kill your daughter, AIDS did,' says Brenda. 'You mustn't carry that guilt'. Lucia's face is distraught. 'It's in me', she says. The letter is from Rose, the nurse who looks after the AIDS clinic in Alexandra. It was in 2004, in the Wakefield general store, that Rose met Norma, and the link between these two very different communities began. 'So many elderly people have been deprived of communication', she explains, while the stigma surrounding the disease is terrible. 'They started laughing at me,' explains Lucia. 'They started avoiding my house. They didn't want their children to play with my children.' For these women, it is the friendship, as much as the money that is valued. All over America grandmothers are forming groups inspired by the Wakefield Grannies and the help they are giving. Today one of the Wakefield Grannies has received a letter from Petronella. 'Greetings from far away South Africa', she reads. 'Your card shows that Canada is a very cold place ... Thank you for all you are doing ... My wish now is to see you personally.' 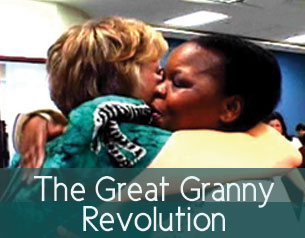 Now with all the attention the 'Granny Revolution' is receiving, Petronella's wish comes true. The UN fly out a group of the South African grannies and Rose the nurse to Canada. It is the first time many of these women have met, and hugs and smiles are everywhere. Rose makes a speech, and thanks them for 'the love, the care, the support.' She is visibly moved. 'I've never seen a community so united. And I'm just wondering why do we have to come all the way to find such love.' She composes herself. 'I'm just humbled', she says. This is a simple story of ordinary people who are working to change a small corner of life for the better. Brenda and Robert Rooney work together. Robert shoots and edits, and Brenda records sound on location. They have had a 30 year relationship with South Africa having been much involved in the Anti-apartheid movement. They did three events for Nelson Mandela and in fact of the 6 Rivonia Trialists (jailed with Mandela), they have worked with three.